The Lord has been moving in so many ways this week. Let us pause in prayer over these things. Travel. It is a blessing that the reach of my foreign missions has been limited to those from “acceptable” lands and nations. God forbid that I should have to convert any godless people from Iran or Yemen (wherever THAT is). For that reason, I’m so pleased that our President has restricted entry by those peoples into our great nation. Oddly enough, all peoples from Iraq are now allowed access to the land of the free. This puzzles me greatly. But a sweet woman in my Sunday School class is a local school math teacher and she was able to explain it to me. IRAQ = OIL + TILLERSON + REPUBLICAN MONEY. Now, were we to lose this equation, many of the wealthy might be brought down to abject poverty where they run the risk of meeting our Lord and Savior in his ministry to the poor. Let us pray. Trudeau. 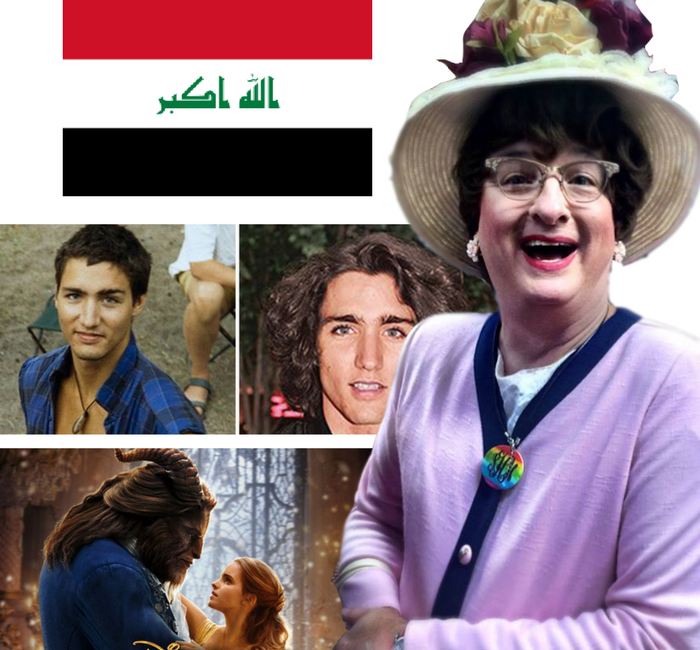 While liberals in America fuss and fume over President Trump, Canadian sinners to our north are allegedly fawning over various dated photos of their Prime Minister, Justin Trudeau. As a woman of conviction, I felt the need to see these photos as well. I found them to be so filthy that I ran to cleanse myself. Thoroughly. Listen, there are just some things which you cannot “un-see”. In fact, the image burned on to mind is driving me to my knees even as I share these thoughts. Glory! Trouble. God bless the Christians of northeast Alabama. A theater in the town of Henegar has refused to show the latest Disney trash, BEAUTY AND THE BEAST, once it was realized that there is a gay character in the film. Praise the Lord! Theater owners were quoted as saying, “If I can’t sit through a movie with God or Jesus sitting by me then we have no business showing it.” I couldn’t agree more. The Lord told me just last week how much he hated LA LA LAND. Frankly, I think the sodomite character is the LEAST of the film’s issues. I guarantee you that the Messiah wouldn’t be caught dead (again) viewing a film with a love story centered around a woman and a beast! Grrrrrrrrrrrrrrr. The 701 Club: What? What??? and WHAT??? ?